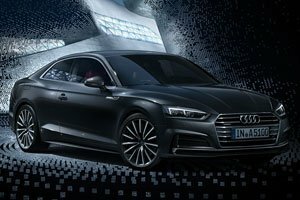 The Audi A5 Coupe strikes a balance between fuel efficiency and power, thanks to its B-cycle engine, 60kg weight reduction and more aerodynamic exterior. 4 out of 4 (100%) reviewers said they would recommend this vehicle to a friend. The Virtual Cockpit is too amazing, have never seen this before and this really excites me. Test drove it, the interior looks as spacious as the A6 and I love the sporty front bonnet. Very powerful drive, you will love it at first sight and keep thinking of it thereafter. 2. Sporty and fierce exterior. 3. Very classy interior with brown leather. 4. Push button brake instead of handbrake / footbrake. 7. Sporty seat that grab your body tightly. 1. Slightly lower height for rear passenger seat. Test drove the 190HP model. Nice drive, very good power for daily use, light steering, ride suspension is on the sporty side but can also choose the option to upgrade to dynamic damper type for more comfort and yet still able to select sporty setting at will. 1. Sleek exterior design with stupendous lines. 3. Virtual Cockpit and MMI combination is a winning formula. 5. Awesome extended 3rd brake light. 6. Dynamic rear signal lights, car at the back would likely give way to admire the running signal light. 1. Front Grill looks similar to a Korean brand car. 2. Standard sports leather seats are of rough surface. 3. Could have complete the package with a courtesy entry for the driver. I really like the changes that Audi has made to the exterior of the A5 Coupe. Although minor, they do make the car look more elegant yet sporty at the same time. Performance on this thing isn't insane like the RS6 or S4, but it is still a pretty fast car. You can easily exceed the speed limit on most roads without even noticing. So keep an eye on that speedo! Interior is really comfortable and button layout feels natural. I like how the gear shifter acts as a wristpad for the touchpad. Design and stylish outside, likely to be a head turner for car enthusiasts. Handling is good on both dry and wet roads. Acceleration is superb exspecially from 0-50km. Interior a bit dated, should follow A3 styling. Exhaust sound is aggressive and deep. Petrol consumption a bit high so prepare to fork out petrol money. Authorised Distributor Audi cars are Audi A3 Cabriolet Reviews, Audi A3 Sedan Reviews, Audi A3 Sportback Reviews, Audi A4 Avant Reviews, Audi A4 Sedan Reviews, Audi A5 Cabriolet Reviews, Audi A5 Sportback Reviews, Audi A6 Reviews, Audi A7 Sportback Reviews, Audi A8L Reviews, Audi Q2 Reviews, Audi Q5 Reviews, Audi Q7 Reviews, Audi Q8 Reviews, Audi R8 Reviews, Audi RS4 Avant Reviews, Audi RS5 Coupe Reviews, Audi S3 Sedan Reviews, Audi S3 Sportback Reviews, Audi S4 Avant Reviews, Audi S4 Sedan Reviews, Audi S5 Cabriolet Reviews, Audi S5 Coupe Reviews, Audi S5 Sportback Reviews, Audi SQ5 Reviews. Parallel Imported Audi cars are Audi A5 Cabriolet Reviews, Audi A8 Reviews, Audi A8 Diesel Reviews, Audi Q3 Reviews, Audi Q5 Reviews, Audi Q7 Reviews, Audi Q8 Diesel Reviews, Audi S5 Cabriolet Reviews. sgCarMart is the number one car site for buying Singapore cars, including new cars, parallel import cars, Toyota, Honda, Nissan, Volkswagen, Mitsubishi & BMW. We have new car dealers comprising parallel importers, authorised car distributors, and used car dealers who have the New Audi A5 Coupe latest price Find new car pricelists, new car launches, new car promotions, new car reviews, latest car news & car articles. Read the New.Audi A5 Coupe consumer reviews to help you decide on buying a car. Also join our car discussion and forum discussion for car reviews, motoring news & motoring guides. Visit our partner sites who have job openings for Singapore jobs, Singapore classifieds, mover and real estate properties for sale.